A couple of weeks ago, I spotted an image of a gorgeous teal dress with rose gold sequins on Pinterest. Immediately I knew I wanted to translate it to a manicure! To get the look, I used a teal lacquer from H&M as the base coat. 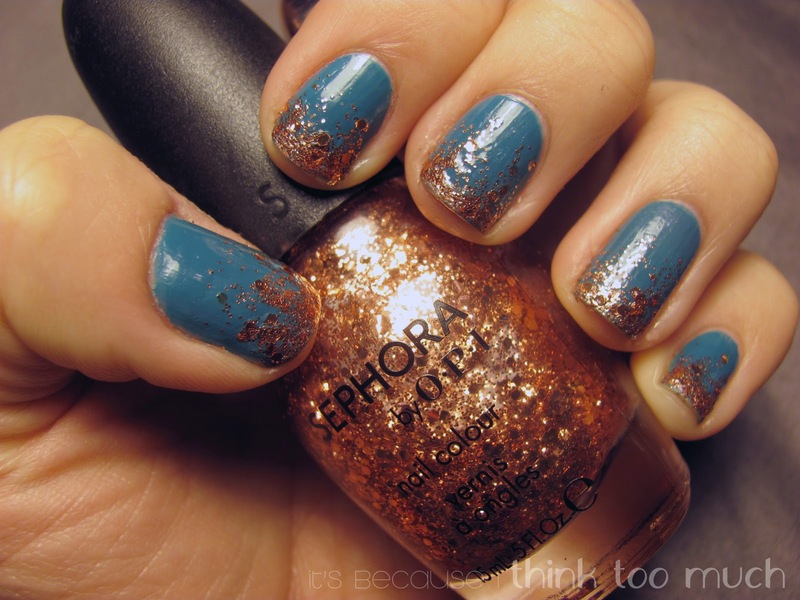 The rose gold glitter is Revlon's Rage at the tip and Sephora by OPI's Don't Be Eggnogious in a gradient top layer. 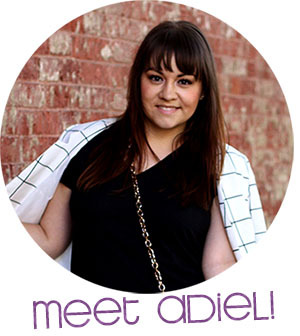 A little while back, I won a nail art goodie bag on the Pose app. One of the items in it was this set by Nails Inc. 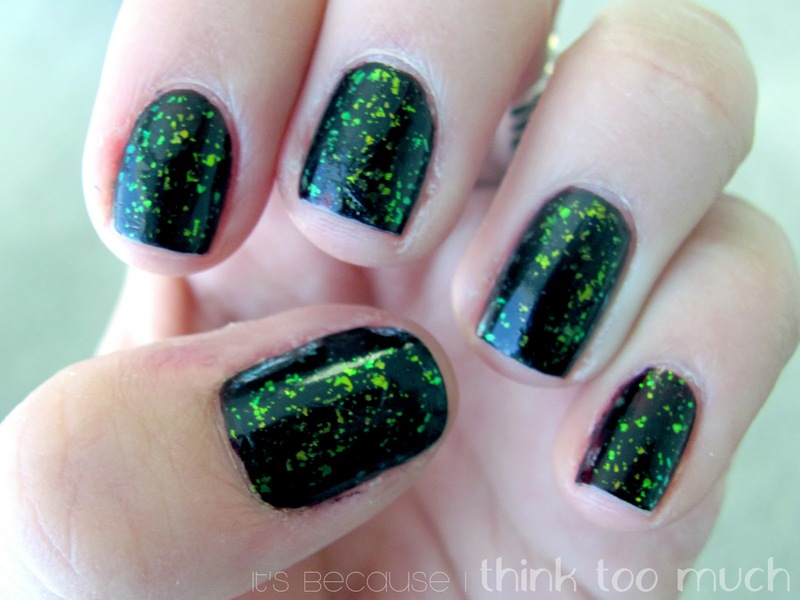 The base coat is a deep plum color, but with the holographic green Donmar top coat, it looks black. I'm a big fan of this look! I finally got around to trying these lacquers from CND's Fall/Winter 2011 collection; Midnight Sapphire and Sheer 24K Sparkle! It reminds me quite a bit of my Galactic Manicure! 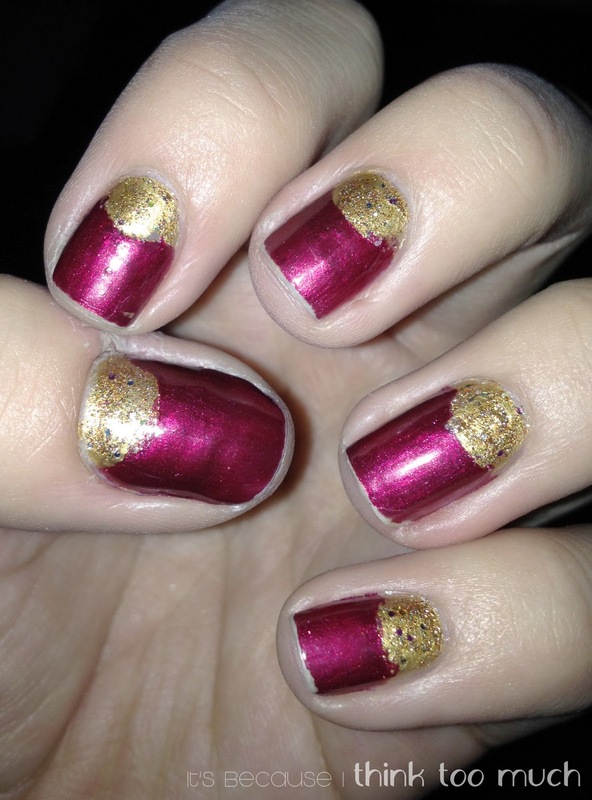 To support the 49ers in the NFC championships last weekend, I polished my nails in the team colors. I did I base coat of Revlon's Golden with a bit of Nicole by OPI's Disco Dolls for a bit of added sparkle. Instead of using french tip guides like I usually do, I used hole reinforcements to tape off the half moon. Then I swiped two coats of Sephora by OPI's Sample Sale. The hole reinforcements weren't great; the red leaked under the sticker and I had to do quite a bit of clean-up. What are the best manicures you've seen lately? Please share! I like the 49ers nails a lot, but I think my favorite is #2: The Donmar Collection one!